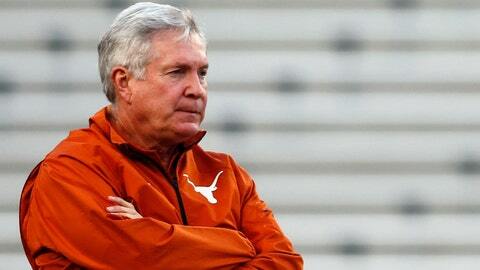 Mack Brown will resign as Texas' head coach after Alamo Bowl. After 16 seasons in Austin, Mack Brown is stepping down as the head coach of Texas, the university announced Saturday. Brown made the decision Saturday afternoon and informed his team that he will not be the coach in 2014. "We appreciate everything Mack has done for The University of Texas," athletic director Steve Patterson said in a statement. "He’s been a tremendous coach, mentor, leader and ambassador for our university and our student-athletes. He is truly a college football legend. I’ve had a number of talks with him recently, and he has always said he wanted what was best for The University of Texas. I know this decision weighed heavily on him, and today he told us he’s ready to move forward." Texas will play Oregon on Dec. 30 in the Alamo Bowl, which will be Brown’s final game on the sidelines. "It’s been a wonderful ride," Brown said Saturday in a statement. "Now, the program is again being pulled in different directions, and I think the time is right for a change. I love The University of Texas, all of its supporters, the great fans and everyone that played and coached here." President Bill Powers also released a statement through the university. "This is a very difficult day for everyone in The University of Texas family," Powers said. "Mack Brown is one of the best football coaches in the country, a tremendous representative of our University, and, most importantly, a great friend. He has produced championship teams with tremendous student-athletes and has always done so with the utmost class and integrity. "Mack is just the best and he will be missed. With that said, I’m excited for the future and the opportunity to work with him in a new capacity for the years to come and am thrilled that he and Sally will remain part of our family." Brown’s new capacity with Texas is to be determined.